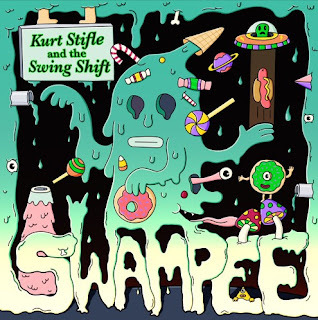 Kurt Stifle and the Swing Shift Release New Single "Swampee"
The Los Angeles band, seemingly born out of a need for music experimentation and diversity, pride themselves on crafting a sound that draws from the past 60 years of pop music. Comprised of Kurt Stifle (Vocals, Guitar), Steve Reed (Bass), and Bob Lee (Drums), they're heavily influenced by classic rock icons such as Cheap Trick, Black Flag, and Bob Dylan. Each one of their tracks submerges listeners in a unique journey through musical history, while the band remains grounded in modern experimentation. Their latest album, "The Pilgrims' Guide to the River of Salvation" is a stylistic voyage of sound, a rock opera that possesses all the camp and humor needed to entertain, while maintaining the musical integrity one would expect from musicians of their caliber. Their newest single, "Swampee" is a wild ride through the streets of Los Angeles, guided by Stifle's gritty, eccentric vocal stylings. This supercharged blues anthem is amplified by a rowdy energy that fits the savage story itself; an unruly devil sent from the fires of hell to rock the world of the protagonist in the worst possible way. Layered vocals, provided by back-up singers Ron Goudie and Geza X, create a chant that is equal parts terrifying and invigorating. The track goes up in flames, both melodically and figuratively, planting the listener in the center of debauchery and no-good-behavior. In essence, giving us all a harrowing flashback into every night of bad decisions we've ever made, with the reverberating electric guitar and rhythmic drums serving as the soundtrack to our shame. Check out Kurt Stifle and the Swing Shift's new single, "Swampee," out now! Check out the new track right here: https://soundcloud.com/user-319700535/swampee-single.